On 14 November, Startupbootcamp FinTech welcomes you to Hyderabad for Startupbootcamp FinTech FastTrack. Selected teams will be invited to pitch, get feedback and learn more about the Startupbootcamp FinTech Mumbai program. All things FinTech and InsurTech! We’ve spent 5 years perfecting our system for accelerating startups, and FastTrack events are a bite-sized glimpse into the value a Startupbootcamp program entails. You’ll have a chance to connect with top mentors, get feedback from other startups, and meet the Startupbootcamp FinTech team. 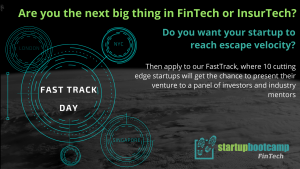 At Startupbootcamp FinTech, we’re looking for top-notch FinTech startups and if you are looking to connect with some of the most relevant mentors in FinTech apply for Startupbootcamp FastTrack now. We’ll inform you at before the event if you’ve been selected to meet at least 5 Startupbootcamp mentors for 20 minute 1-1 feedback and advice sessions.